The seventh painting in my new series of watercolor paintings featuring soft flowing florals and nature overlaid on impressionistic geometric pattern backgrounds! 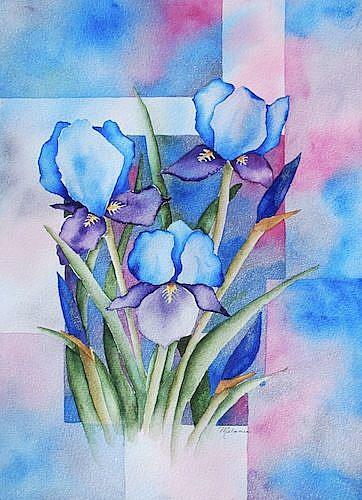 This painting, "Blue Iris" is the first to match another painting in the series. Painted with the exact same paint colors as "Hydrangeas". Painted with Daniel Smith watercolor paints, one pigment is Sugilite Genuine, a natural pigment from South Africa. It's a rare opaque mineral ranges from grayish lavendar to pink to deep purple and has a slight graphite sheen.